Recently I took the opportunity of a brief (albeit cold) respite from the seemingly endless rain to stroll down the hill from Brooklyn Heights and check out the new Brooklyn Bridge Park. 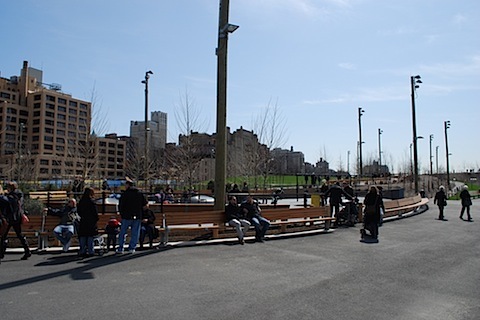 Pier 1 of Brooklyn Bridge Park officially opened in March on the same pier that housed the “pop-up” park last summer. It’s nice to see Brooklyn Bridge Park turning into something after watching its future trees stand in a line for an entire year. And although it is fairly small, they’ve clearly decided to include something for everyone in this first part of the park, including a playground. 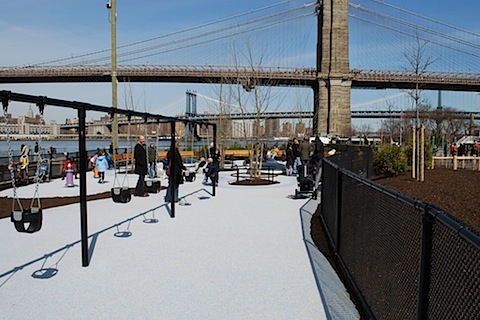 In truth, the “Pier One Playground” isn’t very large, boasting only a set of toddler swings, some metal mounds that look like they will get very hot in the summer, a few spinning poles and some ceramic animals to climb on. 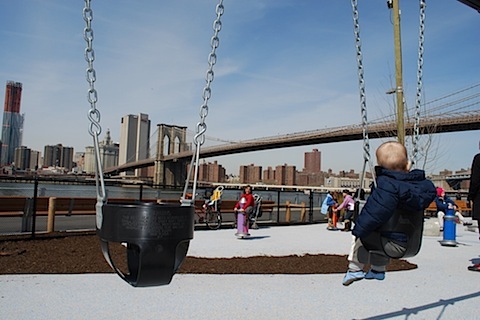 The main draw to the playground is the incredible view, as it is situated right on the East River and almost directly below the Brooklyn Bridge. The rest of the open part of the park consists of walkways both along the river and over a manmade hill, a large set of granite steps and large grassy areas (although the grass is roped off until later this month and the granite steps are closed for the time being). Even in this small state though, the park is worth a visit. Any new park is welcome and this one adds another playground and real grass to the neighborhood. Also, now that part of the park is open, you can start to see what a great addition to New York City the finished park will someday be. 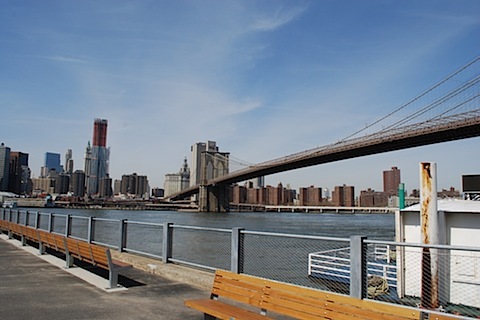 To get to Brookyn Bridge Park take the A/C to High Street or walk across the Brooklyn Bridge. Note: The white stuff on the ground is rubber matting, not snow.